In September 2012, Senators Kohl, Grassley, and Blumenthal introduced S. 3604, the Improving Dementia Care Treatment for Older Americans Act, to cut the misuse of antipsychotic drugs for nursing home residents with dementia. The bill would require the Department of Health and Human Services to issue standardized protocols to nursing homes for obtaining informed consent from residents or their surrogates, acknowledging possible risks and side effects associated with an antipsychotic, as well as alternative treatment options, before administering the drug to an older adult with dementia. There is no pending California legislation that would directly address the misuse of psychoactive drugs by nursing homes or other types of long term care facilities. However, there are numerous existing laws on this subject. 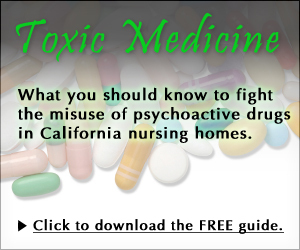 Current laws are summarized in CANHR’s consumer guide, Toxic Medicine: What You Should Know to Fight the Misuse of Psychoactive Drugs in California Nursing Homes. In 2009, CANHR sponsored a landmark bill, SB 303 (Alquist), to codify and strengthen existing California rules requiring doctors to inform residents and their representatives about the dangers of mind-altering drugs and requiring nursing homes to verify that residents or their representatives had given consent before these drugs could be used. SB 303 required physicians to provide pertinent FDA warnings in writing and prohibited nursing home staff from implementing psychoactive drug orders if the resident or resident’s representative indicated that they had not given consent or had other concerns. The California legislature passed SB 303 by a wide margin but it was vetoed by Governor Schwarzenegger. In his veto message, the Governor admitted that misuse of antipsychotic drugs is a pervasive problem in nursing homes. He cited a recent study that found more than half of residents on antipsychotics are being drugged outside federal guidelines, yet vetoed the bill anyway. The Governor gave no explanation for his veto, which put the interests of substandard nursing homes and unethical doctors above elderly and disabled nursing home residents. CANHR is committed to pursuing legislative solutions to nursing home drugging and is considering legislative options for 2011. Below you will find links to many of the relevant laws and regulations having to do with drugging of nursing home residents. To read the following laws and regulations, click on the category. Click here to read CANHR’s Informed Consent FAQs for Nursing Homes.